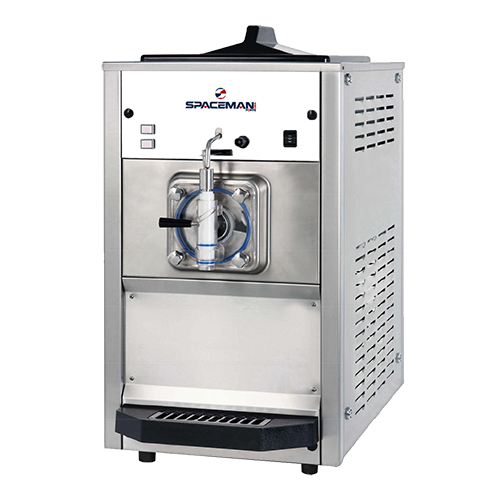 The Spaceman 6690H – High Capacity, Single Flavor Counter Top Frozen Beverage Machine is Ideal for Frozen Beverages, Slush Beverages, Margaritas, Smoothies, Shakes and Frozen Coffee Drinks! The Spaceman 6690H single flavor frozen beverage machine has pre-cooling in the hopper, making it approved for dairy and extremely versatile! High volume operations can serve milkshakes, smoothies, frozen coffee drinks, margaritas or slush. Its countertop is an easy addition to any bar or restaurant, gas station or catering business, even mobile units! The hopper agitator will stir product throughout the day, saving time and ensuring an even cool in the hopper. Patented freezing technology makes for a super fast recovery time in the 7.3qt cylinder, producing 60 qts/hr, or 240 drinks every hour. Spaceman 6690H Slush Machine is perfect for your menu by offering shakes & smoothies or fruit juices, coffees, cappuccino and tea slush beverages, all served at the desired thickness. The 6690H is also great for frozen beverages containing alcohol, frozen beer foam, and other creative mix drinks! The Spaceman 6690H Slush Machine has a Specially designed viscosity control automatically maintains superior product quality. Adjustable control allows the operator to serve a wide variety of frozen beverages at the desired thickness.